UP TO €8,000 was stolen from a church in Clare on Sunday night. 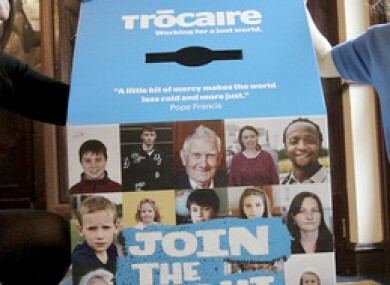 The contents of dozens of Trocaire Lenten Campaign boxes were taken along with Easter Mass donations. The robbery at Ennistymon church is believed to have taken place at some time between 8pm on Easter Sunday and 10am on Easter Monday. The thieves broke a window in the church as they forced their way in. They then broke into a room that was locked inside the church and broke into a safe. TheJournal.ie understands that between €5,000 and €8,000 was taken in the robbery. Gardaí are investigating and are appealing for the public’s help with identifying those responsible for the burglary. Anyone who can assist with the garda investigation is asked to contact Ennistymon station on 065 7072180 or Kilrush station on 065 9080550. Email “Up to €8,000 stolen from Trocaire boxes in Clare church ”. Feedback on “Up to €8,000 stolen from Trocaire boxes in Clare church ”.